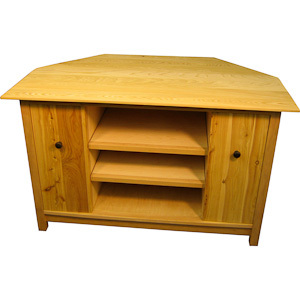 The Boothbay Corner Home Theater cabinet fits snugly into those tight corners. The cabinet can easily support a 50 inch Plasma or LCD display. The unit comes with two adjustable shelves. A wire access portal is in the back of the unit. On each side are two roll out drawers for your DVDs or CDs. The drawers hold approximately 70 standard DVDs or 132 CDs. Each Drawer comes with two adjustable shelves. This particular piece was done in a mix of Cherry and Australian Cypress and is now a part of a private collection. I can make this piece in any of my standard hardwoods as listed below or in other sizes and configurations. Please feel free to inquire on what I can do for you.